The Cycle of Inquiry System is a set of organizational forms developed for teachers to record their planning and implementation of an inquiry curriculum that focuses on problem solving and reasoning skills for maximum achievement, moving beyond ages and stages skill attainment. The COI forms correlate with each step of the Cycle of Inquiry System illustrated below. Implementing and evaluating the plan. 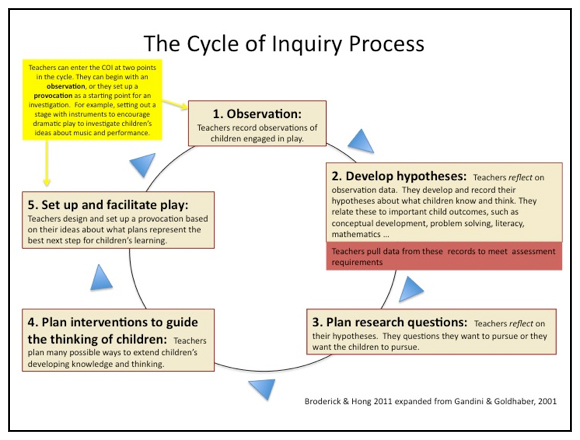 Will use the Cycle of Inquiry System (Broderick & Hong, 2007; 2011) to document children’s and teachers’ thinking throughout. Designed to guide teachers to learn to document, reflect, and plan intentionally, there is a form for each phase of the cycle. Will use the Participatory Adult Learning Strategy (PALS, Dunst & Trivette, 2009) to assure an effective embedded instruction model that promotes teachers’ “active participation in learning experiences that enhance their knowledge, skills, understanding, and adoption of the [COI] practice. Additional training sessions extend the focus of the four phases of the Cycle of Inquiry, as needed, and/or will include some focus on classroom management, classroom meetings, and documentation panels. We recommend allowing time between each training session to allow for assimilation into your practices within your context. We can provide, and also recommend, awhere teachers, directors, and curriculum specialists can interact with Drs. Broderick & Hong through an interactive online classroom set up as a blog site on a protected server.